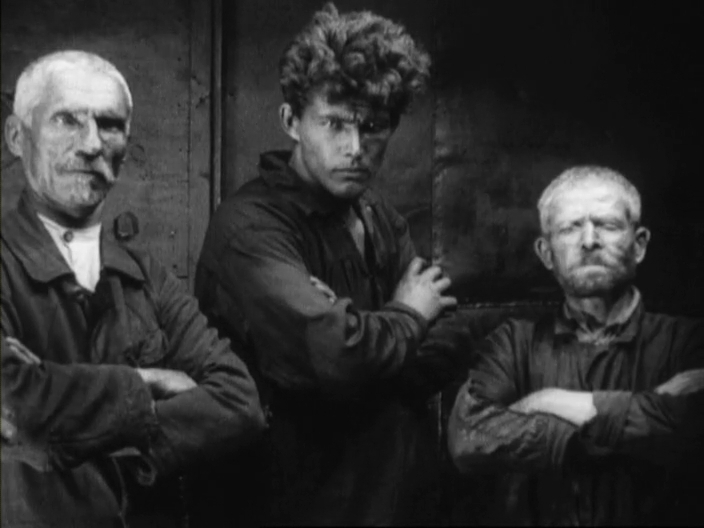 An academic paper I wrote on how early Soviet director Sergei Eisenstein uses discontinuous editing in his film Strike to encourage his audience to empathize with his protagonists. Strike is a piece of propaganda made in 1925 about the worker’s revolutions at the turn of the century in order to remind citizens of the Soviet Union why they revolted in the first place, and that they should therefore continue to support the government. Strike: A movie about angry people that wants you to get angry, too. 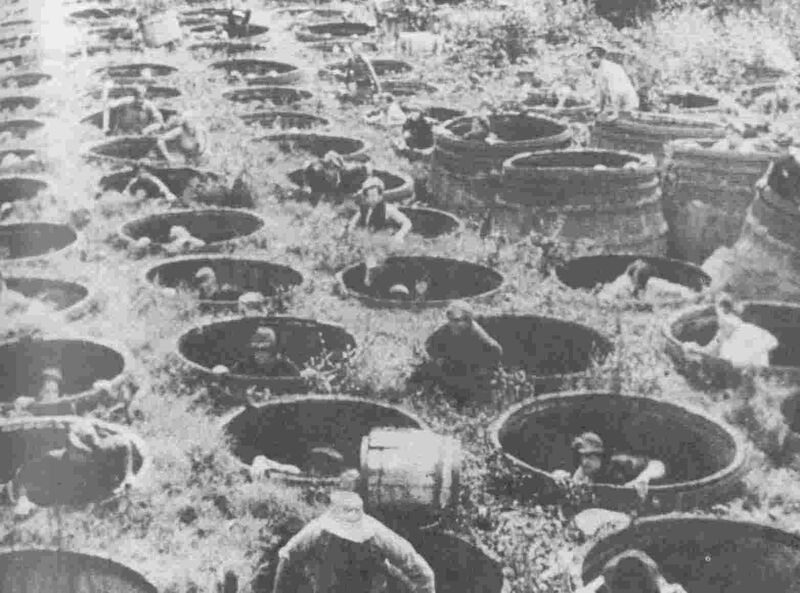 Strike is a piece of Soviet-era propaganda created by Sergei Eisenstein, who uses his mastery of filmmaking techniques to communicate his central thesis. A 1925 film set against the backdrop of Pre-Revolutionary Russia circa 1903, the film was meant to keep core tenets of the struggle alive and the fires of unrest burning in the minds of the Soviet people. To do this, Eisenstein took the accepted conventions of continuity editing from 1900-1910 and turned them on their head in order to elicit confusion, panic, and other emotional responses from his audience (Bordwell and Thompson, 2010). One clear example of this comes when the worker Yakov is accused of theft of a micrometer, and the camera jumps around the room between him and the managers. Strong close-ups and rapid cutting give us a sense of the heat of debate, even though there is no dialogue accompanying the scene. Shortly thereafter, Yakov kills himself in a final act of defiance. This incites a riot among the people. During this riot, the camera seems to jump to the front, back, and sides of the disgruntled workers who are throwing rocks at the foundry. When the riot builds further and seize control of one of their managers and places him in a wheelbarrow, the camera continues to cut behind and in front of the incensed crowd, as well as on its left and right flanks. The camera’s final position is shows the wheelbarrow as it rolls down into the water; in the reverse shot, the workers stand triumphant on the hill. In a later scene, a crowd is suppressed with hoses as the camera wildly jumps from one victim to the next. Throughout this entire riot, there is a clear focus on violence accentuated by Eisenstein’s choice of quick cuts which constantly violate the 18o-degree rule. In the third chapter, a man is photographed and subsequently captured by the police. Upon returning to the prison, he is severely beaten. Eisenstein shows this entire sequence in rapid succession, jumping from one angle to the other. The brutality of this scene is therefore amplified and the audience, sympathetic to the worker, finds the scene infuriating. 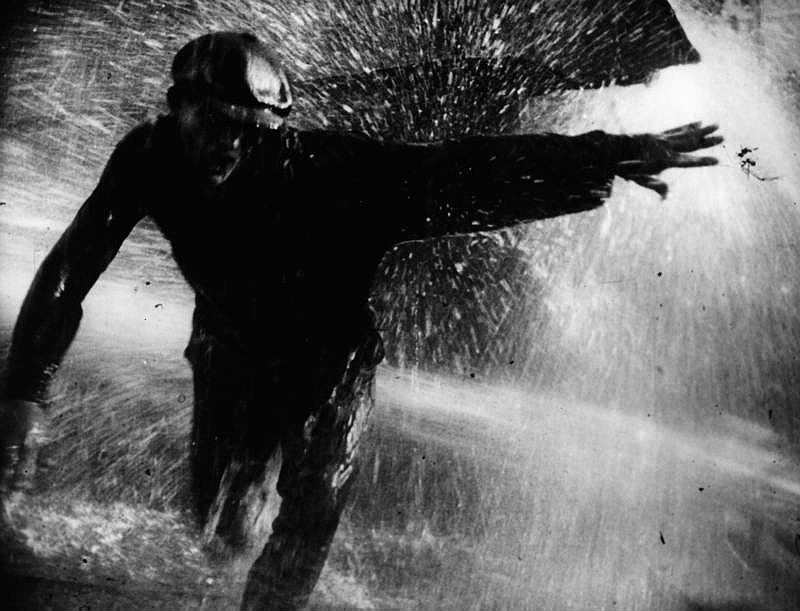 In the final scenes of the movie, Eisenstein depicts a last-ditch effort from the workers as they clash with the police on their way to the foundry. The camera jumps constantly during this sequence, showing a consistently confusing spatial arrangement to the viewer. This scene is meant to induce a fear and adrenaline response from the audience as the workers are chased by the armed policemen on horseback through the streets. During the last moments of the film, the mass murder of the workers by the police is interspersed with footage of a cow’s slaughter. 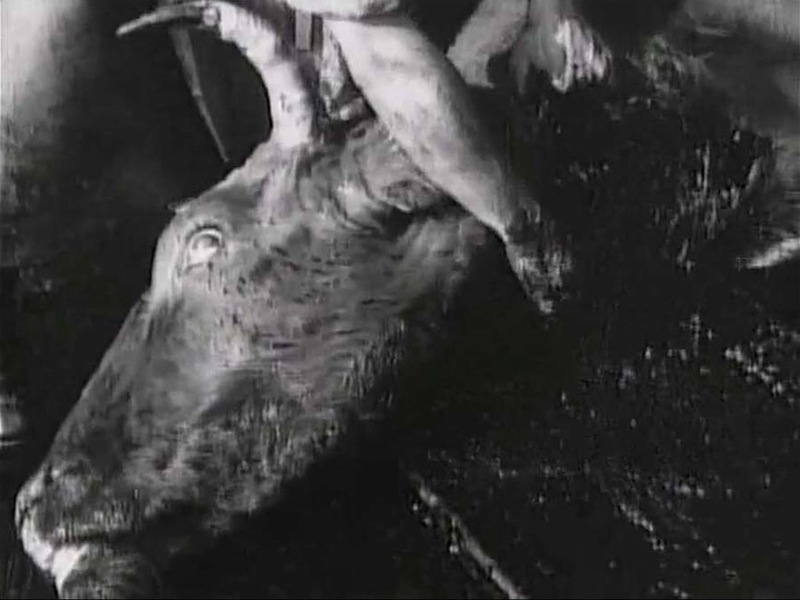 Ultimately, as the conflict comes to a close, the slaughtered cow mirrors the slaughter of the people. Eisenstein cleverly uses montage (image juxtaposition) to replace the audience’s feelings of fear and panic with those of anger and resentment. The death of the bull parallels the death of the rebellious workers. Violence isn’t the only sentiment Eisenstein gets across with discontinuous editing. In the fourth chapter, the scene opens on a visit by a police agent to the “King.” As the scene progresses, he makes a deal with the “King” to give him a few workers who will set a building on fire in order to provoke a riot that the police can then act on. During this volunteer selection process, shots are shown in rapid succession of the volunteers and the surrounding environment. No violence is going on here, but the audience is left with the distinct impression of disorganization among the “King’s” people. Similarly, a scene in the third chapter where an old woman is hiding a bowl of soup under her dress also shows some discontinuous editing. The camera jumps from her side to her front, then to a close-up, and finally to a point-of-view shot. Again, there is no violence occurring in this scene; instead, Eisenstein shows this woman exhibiting some level of secrecy about her food supply. This also helps to set the scene for this chapter, as well as reaffirm the importance and scarcity of food for the strikers. The “King’s” volunteers a chosen. The real power of Strike comes from its juxtaposition. There is a clear dichotomy in this film between its slower, non-violent moments and its fast-paced, kinetic scenes. The audience is lulled into some basic sense of security by the tamer segments of Strike; sometimes these scenes are meant to elicit anger, as in the scene in third chapter where the audience is shown the fat cat stockholders, or to induce relaxation (the first leisurely days of the strike in the third chapter. And each time, the viewer is shaken out of this passive state by Eisenstein’s discontinuous, frenetic edits. This technique is also used more subtly, as when the workers are jumping into the water toward the beginning of the film; as we see the out-of-place cuts behind the swimmers, we are given some sense of the discontent of the worker. At some level, the Alloy Orchestra soundtrack added much later to Strike subverts Eisenstein’s intention by incongruously dramatizing the rather undramatic sequences, reducing the overall impact of his filmmaking choices. Taken simply as a silent film, we see a more effective clash of editing technique. By setting these two distinct styles against one another, Eisenstein conveys his central thesis that the revolution is never over, and that the proletariate must continue to support the current regime – because supposedly, they fight for the people.